Monmouth County: Monmouth County Sheriff Shaun Golden, Clerk Christine Hanlon and Surrogate Rosemarie Peters are pleased to announce that the Mobile County Connection will have a satellite office at the Monmouth Mall which will deliver county services to the many people who frequent that location. 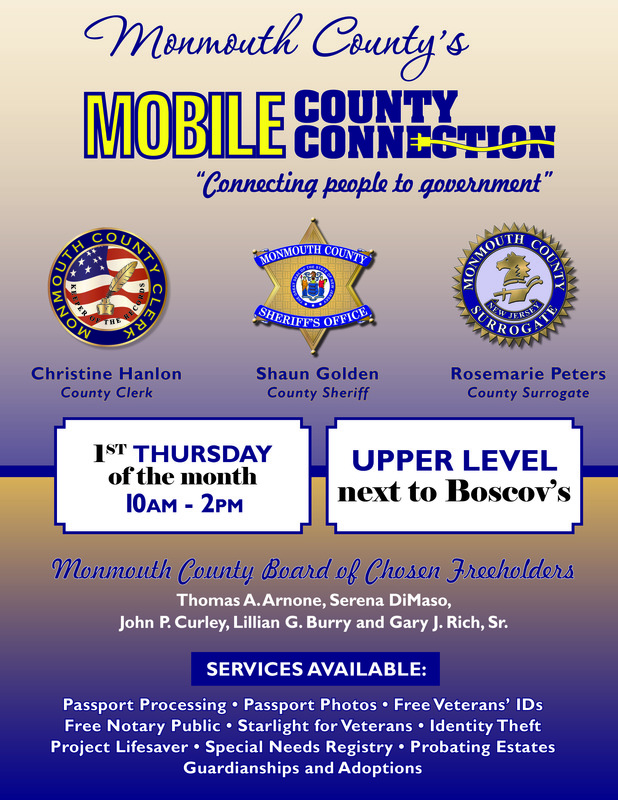 The Mobile County Connection office will be announced at the Monmouth Mall in Eatontown on Nov. 3 at 11:30 with a ribbon cutting ceremony. From 10am to 2pm, people can apply for and renew their passports as well as have passport photos taken, access to free notary services and obtain free veteran’s and ident adult identification cards. Information regarding the Starlight for Vets Program, Identity Theft, Project Lifesaver, the Special Needs Registry, Voter/Election, and, Probating Estates, Guardianships and Adoptions will also be available along with other programs throughout the county. The Mobile County Connection will be available at the Monmouth Mall on the first Tuesday of every month from 10am to 2pm. It will also continue to visit municipalities, senior centers and libraries throughout the year.